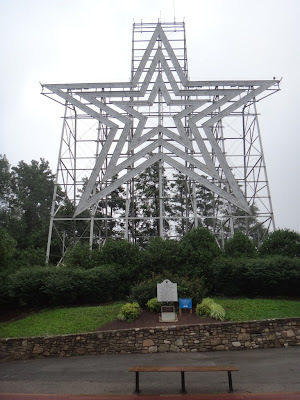 Photograph 1 - Thge Mill Mountain Star at Roanoke, Virginia - the world's biggest man-made star built in 1949. 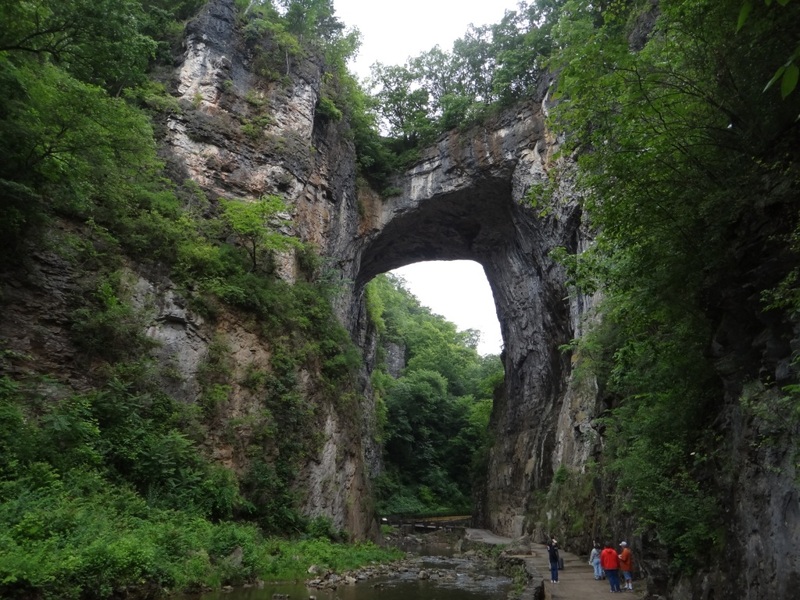 Photograph 2 - The Natural Arch near Glasgow, Virginia. Photograph 3 - View of the town Buena Vista from the Blue Ridge Parkway, Virginia. Photograph 4 - The location where Stonewall Jackson was accidently shot by his own soldiers in 1863. At the Chancellorsville Visitors Centre, Virginia. 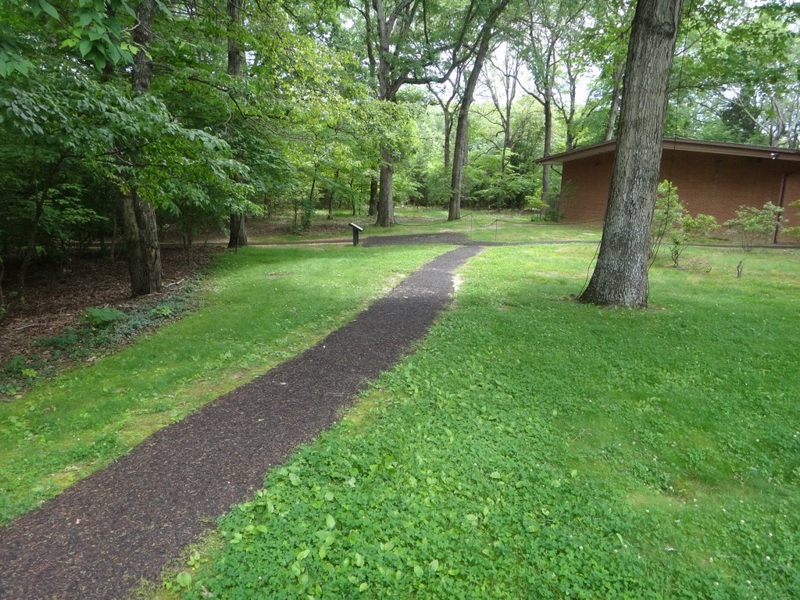 Photograph 5 - The actual site of the Battle of Chancellorsville and where the Chancellors family mansion was located, Virginia. We can’t believe this is Day 31. The days are really rolling by and our first week in Honolulu is just memories. We are almost at the half way mark (Day 36 is that milestone). 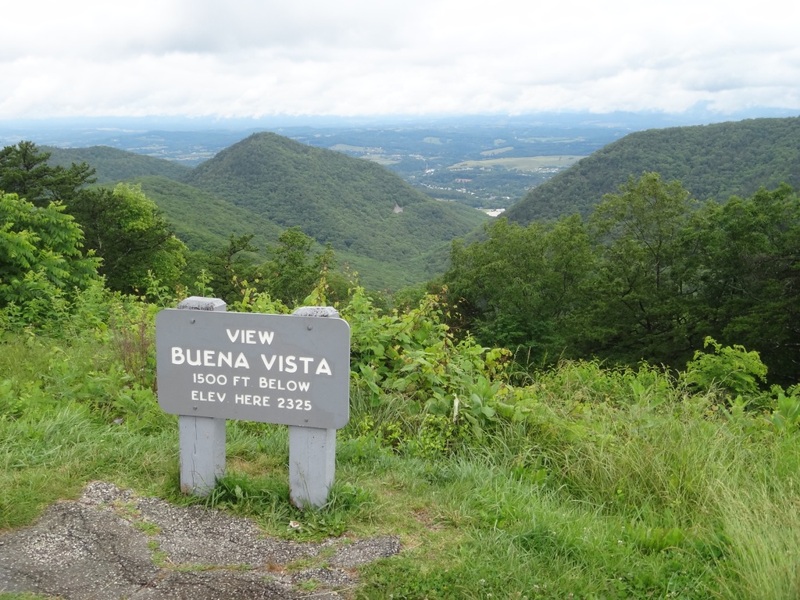 We departed Roanoke (pronounced Row-an-oak) for the Blue Ridge Parkway. However, just off the entrance is the Mile Mountain Star of Roanoke. This is the world’s largest man-made star and built in 1949. Apparently it is seen all over the city at night when it is lit up. Last night it rained and therefore was obscured. We quickly snapped a picture (see photograph above) and headed north to finished off the parkway. En-route we deviated and visited the Natural Arch. As you can see in the above picture it is huge. There have been many stories we have read and heard by guides during our holidays about famous Americans but the one about George Washington climbing the left side of this feature when he was a young lad amazed us (okay - only for a second). We found our way out of the parkway at noon and headed for Washington DC. About half way there we stopped at Chancellorsville – right in the heart where the bloodiest battle occurred during the American Civil War. Now the stories we have read about this conflict are just as bad as the battles of WW1. Many lives were lost by allowing the last man standing who wins the battle. 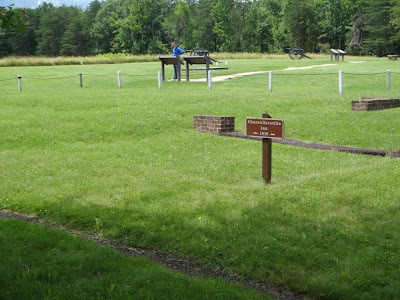 Interestingly, we stopped at the Battle of Chancellorsville Visitors Centre and was shown the exact spot where Stonewall Jackson was accidently shot by his own men and eventually died eight days later. Also we visited the house foundations that the Chancellors family once resided. The particular location was a bloody nightmare where thousands of soldiers were killed or wounded. Apparently Robert E Lee had won this battle for the Confederates in 1863. We still had 100klms to return our vehicle and two hours left. We were worried about the famous American traffic jams and yes we saw them – going in the opposite direction – about fifty kilometers long. How people can handle these jams are beyond comprehension. We made it by 30 minutes and sad to hand the keys back to Budget Rent A Car guy. It was a great machine. We are now at the Ronald Reagan Airport in Washington DC waiting for our 9pm flight to Vegas. We could not arrange exit seats last night but swift talking Anne arranged an upgrade and now we are travelling 1st Class – truly!!!! The only setback with Bare Bones Airlines (US Airways) with first class seats we are not allowed in their lounge. Hopefully this narrative will be placed into the blogspot on our arrival in Las Vegas tomorrow – so cheers from Anne and Neil.